IFRS 16 is an International Financial Reporting Standard that sets out a comprehensive model for the identification of lease arrangements and their treatment in the financial statements of both lessees and lessors. The new rules, which will take effect on 1st January 2019, will require companies to transfer the values of leases onto their balance sheets as liabilities. 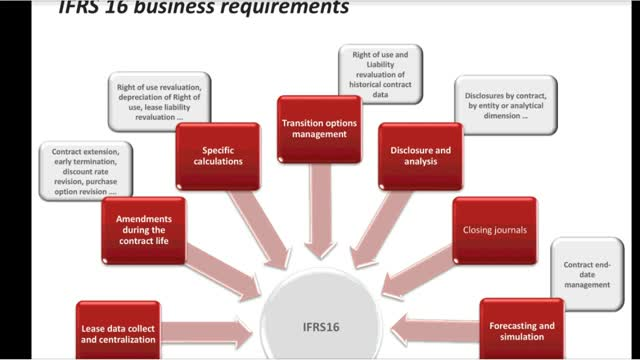 Even though time is winding down on the IFRS 16 deadline, businesses still have an opportunity to implement a solution that can quickly fulfill its requirements—and many are turning to cloud-based, Connected Planning solutions. Join us for this 40-minute webinar, where we will share how Anaplan can help ease the transition to IFRS 16 to keep your company competitive and in compliance. For finance teams using traditional budgeting processes and methodologies, keeping up with the pace of today’s dynamic business environment in the middle of the budgeting season can make this year’s “annual struggle” particularly daunting. Join us as Steve Player, of the Beyond Budgeting Round Table, and Tony Levy, of Anaplan, review techniques such as scenario planning and “what-if” analysis that can help businesses prepare for the future and make choices inthe face of increasing uncertainty. Steve Player is the founder of Live Future Ready, a member-based community of practice that implements more effective ways to plan and control operations. These approaches focus on creating lean, agile organizations that consistently deliver above-average performance. In addition to speaking and training, Player works directly with member companies to implement advanced approaches to continuous planning and performance management. The office of finance is no stranger to disruption. Today’s “Holy Grail” of finance transformation requires that financial planning and analysis (FP&A) teams turn evolving demographics, business models, and technologies into opportunities for uncovering greater insights.  Improve business performance by identifying and implementing FP&A best practices that can strengthen your internal partnerships.  FSN’s most recent research reveals key findings, including the adoption of innovation across finance organizations. The FSN Innovation Showcase reveals that a staggering 85 percent of CFOs and finance executives believe that innovation is the key to more insightful decision making. Learn more and register today. Gary Simon is the Chief Executive of FSN and the leader of the FSN Modern Finance Forum on LinkedIn, with a membership of more than 52,000 senior finance professionals. He is a highly sought-after lecturer and trusted provider of thought leadership and analysis about the development of the modern finance function for CFOs around the world. Chris Stevenson is Anaplan’s Senior Product Marketing Manager of Finance Solutions. Chris has worked in corporate finance, analytics, technology, and marketing. He sees the emergence of artificial intelligence, robotics, and cognitive computing applied to finance and operations as an exciting frontier. Chris enjoys learning how clients leverage analytics, both within and beyond the office of finance. The sales planning process is constantly changing, with new technologies emerging every day to enhance how we meet business goals.However, sales leaders are struggling to understand the implications of artificial intelligence (AI), data and analytics, digital platforms, and robotics, as well as their impact on the business. Anaplan and Deloitte invite you to join this on-demand webinar to learn how these key technology disruptors are impacting the sales organization. In many organizations, sales metrics are typically driven by a sales-only view that can diverge from the company’s overall business plan at the detail level. This is the result of legacy approaches that have limited integration between sales and business operations metrics.In today’s hyper-competitive landscape, successful digital businesses can no longer afford to operate this way. Building truly connected sales plans and strategies that are tightly linked to enterprise performance management, CRM, and other critical business data ensures that every part of the organization is working together. Watch this webcast to gain key insights into incentives and best practices for true sales and business alignment. Discover the changing world of incentive compensation. Would a psychologist agree with how we design incentive plans? Sales compensation plans are traditionally designed around sales roles, and they assume every individual has the same motivations—which psychologists would disagree with. One of the great visions for sales compensation is to provide a level of personalization to sales comp plans to maximize the motivation of individual sales representatives. As a result, more and more companies are tailoring their incentive plans to increase motivation in their sales reps and encourage desired sales behaviors. Join Steve Marley, co-author of The Future of Sales Compensation, in this webinar as he discusses how companies are enabling personalized incentives to benefit both the individual and the company. This webinar is brought to you by Anaplan and its partner ZS Associates. Learn to keep the elements of your go-to-market strategy working in harmony. An increasing number of organizations today are using more accurate, real-time data and encouraging cross-functional collaboration—ultimately driving better-informed decisions about the workforce, investments, and company growth. All executives know that strategy is important. But they fear developing a strategy that involves placing bets and making hard choices. As a result, they engage in the more comfortable process of preparing a comprehensive plan—with goals, initiatives, and budgets. This planning process is a terrible way to create strategy. -the use of standard frameworks that prevent organizations from making good strategy choices. Anaplan is the category-defining leader in Connected Planning, which connects people, data, and plans to enable real-time decision-making critical for today’s rapidly changing business environments. Our platform, powered by our proprietary HyperblockTM technology, is purpose-built to enable large global enterprises to do dynamic, collaborative, and intelligent planning to accelerate business value. Based in San Francisco, we are a privately-held growth company with 18 offices globally, 175 partners, and more than 900 customers worldwide. Connected Planning helps businesses turn response time to real time. Connected Planning joins people together with data and plans to accelerate business value.